Plant Asset Management (PAM) systems is a combination of hardware, software, and services used by industries to examine and watch asset health by monitoring asset condition. Plant Asset Management (PAM) systems are used to determine and forecast the asset condition based on the data received from the embedded in smart field devices, control systems, and various sensors installed into assets to predict potential asset failures and precautionary measures needed to reduce the down time. Globally rapidly growing need for real time data analysis is expected to remain one of the key growth drivers for PAM during the period of study. This report identifies the Plant Asset Management market size in for the year 2015-2017, and forecast of the same for year 2022. 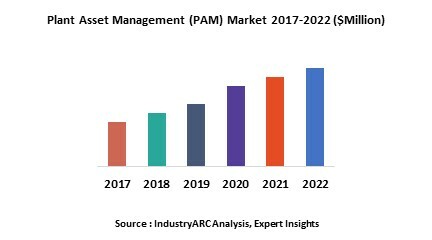 It also highlights the potential growth opportunities in the coming years, while also reviewing the market drivers, restraints, growth indicators, challenges, market dynamics, competitive landscape, and other key aspects with respect to Plant Asset Management market. Geographically Asia-Pacific dominated the Plant Asset Management market owing to large manufacturing base, technological development, and growing adoption and penetration of technological solutions in growing economies of India and China along with strong infrastructure development in the region. Asia-Pacific was followed by North America and Europe as the second and third largest markets for plant asset management. However Asia-Pacific is expected to remain the fastest growing market during the period of study driven by rapidly expanding industrial base and increasing competition amongst major industrial players in the region.